The pathway FORWARD on China’s Yellow Mountain!! The path forward on our hike of Huangshan or “Yellow Mountain“, a mountain range in southern Eastern China. The mountains themselves were carved by glaciers 100 million years ago and the area is well known for its scenery and peculiarly shaped granite peaks. Huangshan is a frequent subject of traditional Chinese paintings and literature, as well as modern photography and was definitely one of my highlights while touring through China. This was also the hardest and most challenging part of my holiday but very rewarding!! I’ve painted yellow mountain and still need to see it in person. on my bucket list. It’s a great life you’re living! Thanks for the compliment! Yes, I am living my dream of traveling through the world!! 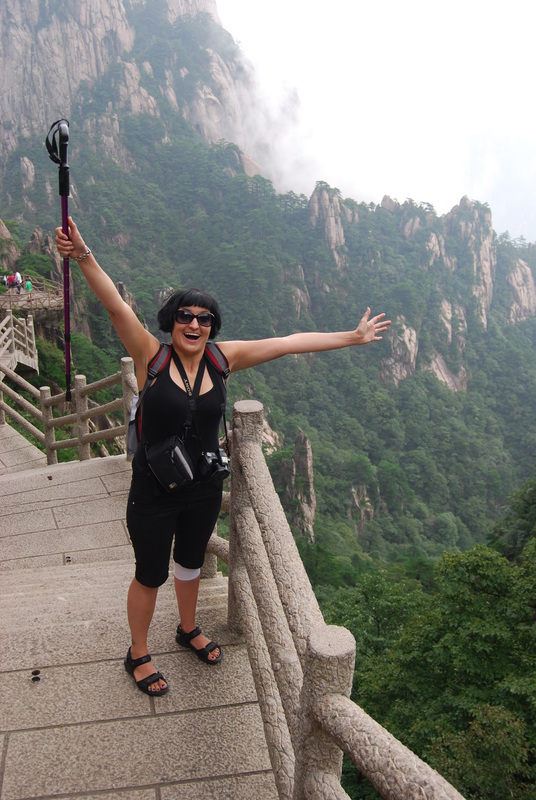 You should definitely go, walking/hiking yellow mountain was such an amazing experience!! It has some of the most beautiful scenery ever!! Yellow mountain!!! Did you visit there on your own or with the tour group? Ek is een van jou groot fans en geniet jou world journey baie! Baie dankie!!! Waardeur die boodskap en bly julle geniet om te lees oor my avonture! !